Every year, dental professionals across the nation dedicate the month of April to raising oral cancer awareness. As we prepare for the 15th Annual Oral Cancer Awareness Month, I’d like to educate all of my patients at my Mill Creek dental office on the dangers of this deadly disease. 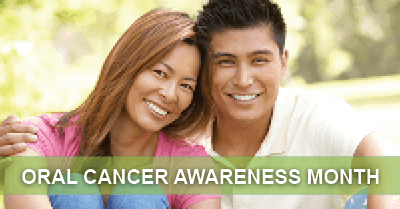 Around 42,000 Americans are diagnosed with oral cancer each year. Of the 42,000 individuals, only about 57% will survive 5 years after diagnosis. The death rate associated with oral cancer is not because it’s difficult to diagnose; it’s because it is often discovered late in its development. This is one main reason why everyone at my dental office in Mill Creek places so much emphasis on maintaining routine checkups. In addition to keeping up with your visits to your Mill Creek dentist and checking your mouth for symptoms at home, there are several factors that can increase your risk for developing oral cancer. People who are heavier drinkers and smokers and are older than 50 are at especially high risk. Additionally, the human papilloma virus (HPV), a sexually transmitted disease, has been shown to increase the incidence of mouth cancer. If you’ve noticed any of the symptoms we’ve discussed here, don’t ignore them! Call my Mill Creek dental office to schedule an appointment as soon as you can. Additionally, if you’re overdue for a checkup, or if you’re at increased risk for oral cancer due to the risk factors we’ve discussed, please don’t hesitate to give me a call. Remember, early diagnosis is key to survival!